This blog has been on hiatus over the end of summer. The extended break between blog posts has not been for want of subject matter, however, as this year has seen many new digital devices and personal gadgets arrive on the scene. I have already gotten my hands on the Nexus 4 smartphone, FitBit One and Basis band sleep and activity trackers, Google Glass, and a Pebble smartwatch. I am also expecting a number of other devices that are not yet available but should be coming off the production line within the next several months: a Memoto lifelogging camera, an assortment of GlassKap accessories for Google Glass, the Recon Jet heads-up display, and an NFC ring. Much of my summer was spent traveling. I was on the road four out of seven weeks on various trips with my family, covering over around 8,000 miles—3,600 miles on the highway and another 4,400 miles by plane—and traveling to Indiana, northern Michigan, California, Arkansas, and North Carolina. Those trips gave me the opportunity to try out my new tech devices in a variety of settings and, in the case of the California trip, to pick up a new and highly anticipated gadget. 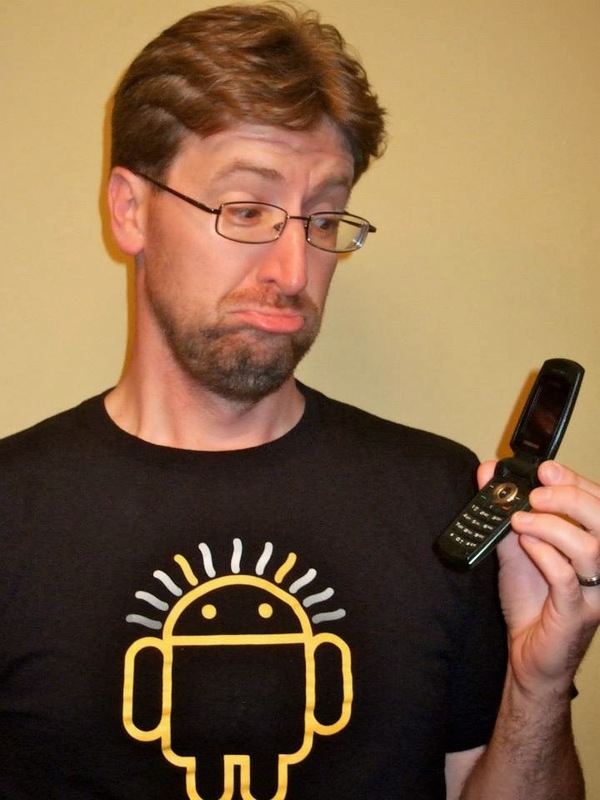 Knowing that Google Glass would benefit from a bluetooth tether to a phone with a data plan, I decided to upgrade my many-years-old Samsung clamshell to my first-ever smartphone. Aware of my scholarly interest in the overlap of technology and culture, my friends and colleagues have frequently been surprised to learn that I do not keep on the bleeding edge of cell tech. While I am enthralled by the rapid advance in personal digital technology, I loathe planned obsolescence and the throwaway society. First made aware of those concepts years ago after reading Alvin Toffler's Future Shock (which popularized ideas that had been around for decades before the 1970s book came out), I have been wary of discarding still-functioning products even if newer, cheaper, improved versions are available. Even my running shoes—which need to be regularly replaced to avoid injury, as the cushioning breaks down before the shoe's outer is visibly deteriorated—get rotated into "walking" and then "yard work" duty before I can bring myself to part with them. So, while not at all fearful of or uninterested in the smartphone revolution, I found myself in 2013 still using a perfectly good "dumb" phone with very limited T9 texting capability, a tiny, grainy screen, and not even a basic camera. I could shrug off friends' and family members' teasing about my antiquated flip phone, though—they sometimes acted as though their prowess at Angry Birds somehow made them my cultural and technological superior—because my decision was based on practicality and finances, not technophobia. I'd been quite comfortable using my wife's iPhone when presented with situations where a useful app was handy—in fact, I'm the one who first got her hooked on the device when I brought home an iPod touch, the gateway drug of the Apple digital family—so the smartphone revolution was not exactly passing me by. I actually worked for Motorola in college, packaging StarTAC phones at the company's Libertyville, IL facility. 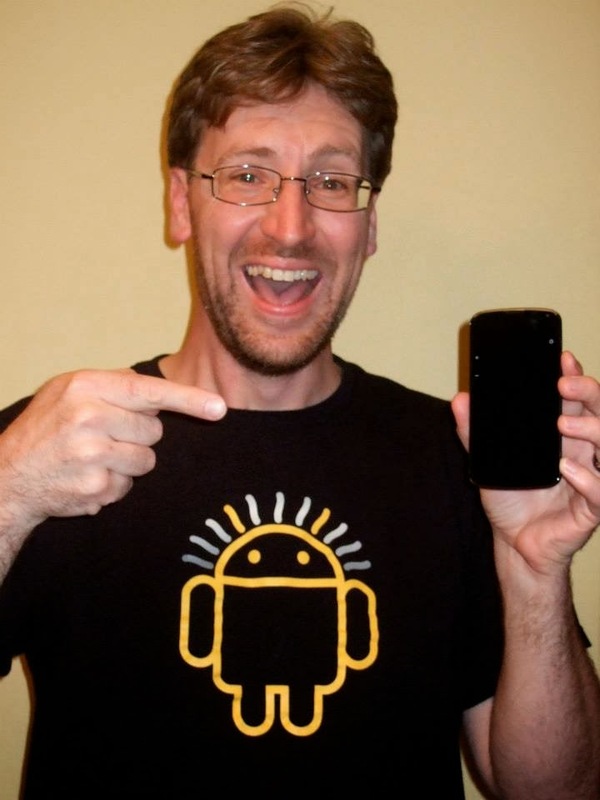 I guess it's fitting that my latest phone is an Android, as Google purchased Motorola's mobile division last year. I definitely have a love/hate relationship with cellular tech, though. Despite my fascination with the amazing digital gadgets that have been been having a significant impact on early twenty-first century society, I find that one of the more troubling societal consequences of such technophilia is the constant and urgent perceived need for newer, if only marginally better, digital devices among the average consumer. However, I eventually realized that, although my old phone hadn't completely broken down, it had certainly outlived its usefulness and would not be able to provide me with the services I would need in my soon-to-be-digitally-augmented life. I decided that, much like demoting to yard work duty an old pair of running shoes that still lace up fine but no longer cushion my feet, properly retiring my old phone did not represent a moral defeat. I ultimately went with a Google Nexus 4, buying it directly from the Google Play store at a much cheaper price than T-Mobile wanted for it. An existing T-Mo customer, I stuck with them because their $30 plan with unlimited texting and data couldn't be touched in terms of affordability. I have since become frustrated by their poor coverage area and spotty 3G service, but that's a topic for a different post. 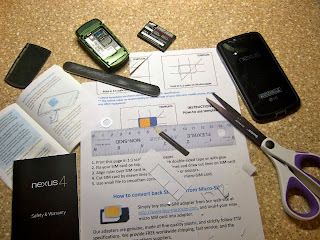 At any rate, I was glad to keep my old number just by switching over my SIM card, which I gleefully cut down to micro-SIM size after reading up on how to perform a DIY card-cutting hack. A range of personal digital fitness and activity tracker devices is now on the market, and I considered several before choosing the Fitbit One and the Basis band as my test products. The basic function of these devices is to serve as a technologically-enhanced pedometer, although some augment step count data with other sources of input. They may be worn on the wrist, clipped to garments on one's torso, or, in some cases, attached or built into footwear. The wrist seems to be a popular choice for these manufacturers; the Nike FuelBand, Jawbone Up, Basis band, and Fitbit Flex, for instance, are all worn like bracelets or watches. Selecting only one or two of these devices is no easy task, for not only do they excel in different areas, but each has an Achilles heel (check out Digital McGuyver's excellent review of the advantages and drawbacks of various trackers). Some boast outstanding battery life, Bluetooth connectivity, excellent companion apps, clear display screens, sleep tracking capabilities, and/or stylish form—but few shine in multiple categories, and none are tops in all of them. Some are hampered by limited features, easily misplaced USB cables/dongles/caps, uncomfortable design, susceptibility to water damage, or inaccurate results (mistaking toothbrushing for running, for instance). I chose the Fitbit One and the Basis Band. Although Fitbit's Flex is the newer, wrist-worn model, the One boasts an altimiter for tracking stairs climbed and clearer display that can show stats and even a clock. Clipping to my pants, the One frees up my wrist for a second tracker; the Basis band won me over for that honor, as it features an impressive array of sensors that can record data including perspiration, body temperature, and heart rate in addition to sleep quality and steps taken. In the near future, I plan to conduct some comparison tests to see which device is more accurate and informative. In this year of the smartwatch, the Pebble has cetainly played a large role. While it is neither the first nor the most recent of such digital wrist accessories, its wildly successful Kickstarter campaign generated considerable buzz for the form factor and thrust the device into the limelight. I was intrigued by its e-paper display, Bluetooth connectivity, and silent vibrating alarm/notifications and decided to try out the much-hyped gadget. Although I missed the official Kickstarter order period, I was able to preorder the device. A month into my wait, I was dismayed to learn that Pebble had decided to sell devices through Best Buy before fulfilling its preorder requests—not illegal, but absolutely a public relations faux pas. I flirted with the idea of canceling my preorder—as did others—and trying out a different smartwatch. After a second month of waiting, I received my official invitation to purchase a watch and went through with it in the interest of trying out and reporting on one of the better-known smartwatches among the spate of digital wrist tech now available. The piece de resistance in my collection of gadgetry is, of course, Google Glass, which I picked up in July. My wife and I made the trip to California to pick up the device, staying with my cousin and her husband while we were in the Bay area. 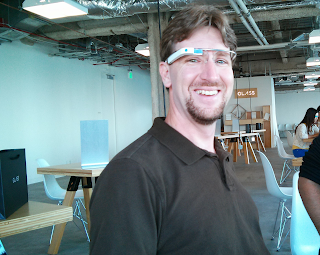 My cousin works for Facebook, and her husband is employed by Google, so we were thrilled to be able to tour both the Googleplex and Facebook HQ before I traveled to San Francisco for my Glass fitting in a waterfront loft that served as a temporary Google workspace. We also squeezed in a visit to the Computer History Museum in Mountain View and drove to Monterey for a day trip. Now, armed with an array of personal digital devices, I am ready to explore what these technologies can offer. This is my journey as Augmented Me.